In 2018-19, Pacific School adopted and began utilizing the FOSS science curriculum, which includes fully developed laboratory and investigative learning activities for all grade levels. This curriculum embraces the goals of the Next Generation Science Standards of getting students involved in data collection and analysis, model-building, engineering, and evidence-based discussion and debate. ​Pacific Elementary School is dedicated to hands-on real-world learning, including field trips. 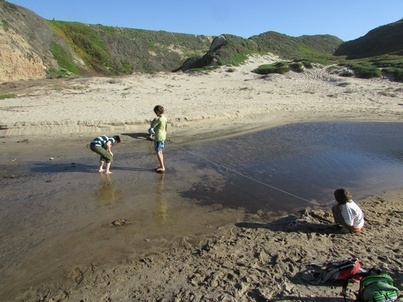 Teachers make extensive use of learning opportunities within walking distance, including citizen science projects using the local San Vicente Creek and the Davenport Beaches. Students in all grades have opportunities to participate in local and more distant field trips at various times during each school year. Families participating in the Independent Study Program organize approximately three field trips each month throughout the school year, including program-wide camping trips, visits to museums, beaches, local small businesses, community service projects, and much more. Students in Fifth and Sixth Grade participate in approximately two multi-day field trips per year. Students collectively fund raise for the program throughout the year, which presents numerous opportunities for learning and practicing entrepreneurship, leadership, economics, and cooperation. The trips themselves typically become a highlight of the students' elementary education. At least one trip every other year is a historical re-enactment of a time period the students have studied. Each year every student in the Third and Fourth Grade completes a substantial science and/or engineering project, culminating in a science fair. Projects are completed primarily in class with the support of the 3rd/4th teacher, Monica Hettenhausen. Independent study students and 5-day fifth and sixth grade students are also invited to participate, although their projects may need to be completed primarily at home. Projects are expected to meet the standards for participation in the County Science Fair.